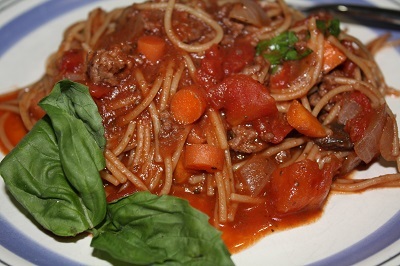 Recently, a friend shared her recipe for One-Pot Pasta Bolognese, which she modified from a Betty Crocker recipe. I thought it still needed something, so…. I decided red wine and mushrooms were what this dish needed. I’ve been playing with this recipe for a while, and finally have something that doesn’t sit in the refrigerator as a leftover. Heat oil in Dutch oven over medium heat. Add onion, carrots, and mushrooms. Saute until tender, 8-10 minutes. Add hamburger, cook until it is browned. Stir in tomato paste, diced tomatoes,broth, wine,and seasonings. Bring to a gentle boil. Break spaghetti into fourths. Tuck the spaghetti into the sauce, making sure the spaghetti is completely covered. Reduce heat to medium low, cook 15-17 minutes, until pasta is at your desired consistency. I’ve since found a few other one pot pasta dishes, hope to try some of them in the near future. These would be great for camping, too! This entry was posted in Main Dishes and tagged carrots, mushrooms, onion on May 18, 2015 by Ruth. I was not expecting green beans in our CSA box this week. (We were supposed to get cucumbers.) It was a pleasant surprise. I would have ordered them instead if that had been an option! Fresh green beans always remind me of helping my Mom and Grandma in the garden when I was growing up in Wisconsin. I’ve done a similar recipe on the grill in the past, but there is something earthy about roasting vegetables that just can’t be accomplished any other way. Place green beans in a medium bowl. Add olive oil and toss to coat. Spread the beans on a cookie sheet. Roast for 10 minutes. Add mushrooms and rosemary to pan, toss to combine. Roast an additional 15 minutes. This entry was posted in Side Dishes and tagged green beans, mushrooms on August 15, 2013 by Ruth.